Carlisle in the far north west of England has a strong industrial past and due to it’s proximity with the Scottish border a history of turmoil! However, this previously austere and highly fortified city now presents a different image. The city still boasts of its association with Hadrian’s Wall and it’s 12th century castle, but these days the cathedral complex and impressive Tullie House Museum, alongside a burgeoning cafe culture in the pedestrianised town centre add to it’s tourist appeal. 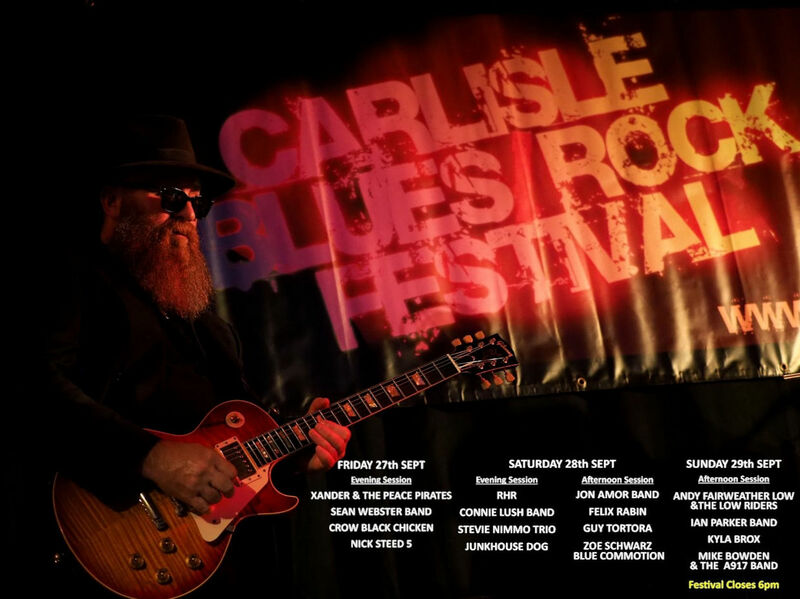 For the past five years there is another reason that folks have been heading to Carlisle, and that is the annual blues festival run by Nick Westgarth and his team. Nick began to build connections within the music industry by bringing national blues artists to the Penrith Playhouse. When Nick relocated to Carlisle in 2005 he began to look for a venue to host a full weekend of music. This resulted in The Lakes Court Hotel (now The Hallmark) hosting the first Carlisle Blues Festival in 2007. Over the last five years the festival has gone from strength to strength and is now located just outside the city centre at The Swallow Hilltop Hotel. Nick’s portfolio of festival acts have included both national and international artists including Sherman Robertson, Earl Thomas, Tom Principato, Michael Burks, Jim Suhler, Mud Morganfield, Hamilton Loomis (all USA) and James Hunter, Ian Siegal, Paul Lamb, Matt Schofield, The Nimmo Brothers, Connie Lush, Nine Below Zero, Larry Miller and many more of the top acts on the British blues scene. This year the festival was re-named The Carlisle Blues/Rock Festival, and Nick unashamedly admits that this was a commercial decision to try and broaden the fan base and attract more punters, whilst also reflecting his own eclectic taste in great live music. This years festival got under way at 7.30pm on Friday 9th November with Gerry Jablonski and The Electric Band, this was high energy blues with a rock edge. The main stage plays to a room which holds 400 people, with seating through the middle section and standing/dancing room at the back and sides, two bar areas added ambient light to the darkened room and Gerry connected well with the crowd from the low stage area. Over a solid rhythm section, well crafted guitar and blues-harp solos set expectations high for the remainder of the festival, the crowd was clearly up for a good time as they stood to applaud the final chord. Next Grainne Duffy’s set was rooted in a southern states country style. Duffy may come from Northern Ireland but her vocal style has shades of both Bonnie Rait and Shania Twain. The self penned compositions of the band were well crafted and bounced along, but the audience was truly won over by her rendition of ‘I’d Rather Go Blind’, the Etta James Classic. You could’ve heard a pin drop! Ian Siegal is always a favourite of the Carlisle Festival fans, and this year his association with the Mississippi Mudbloods produced a good variety of sticky southern grooves, over which his gnarly vocals worked well. The multi-instrumentalist Luther Dickenson of Black Crows fame added an extra dimension to the mix via his terrific slide, mandolin and clever use of effects pedals. Ian seemed to really be having fun, as the band played a variety of tracks from recent award winning albums ‘The Skinny’ and The Candy Store Kid’. Many of the festival goers buy a weekend ticket that includes accommodation at The Hilltop, and for those not quite ready to retire to their rooms more music was available in the side bar. Johnny Whitehill (blues guitarist of the year four times over) presented a new line up called the Groove-A-Matics. This was a fifties inspired up beat set featuring Mick Cantwell who’s singing style was reminiscent of a young Tom Jones, and he played a mean tenor sax too! Unfortunately your reviewer missed the Saturday afternoon session, but this opened with a short acoustic session by Steve Pablo Jones which was followed by Cherry Lee Mewis. Australian Geoff Achison with his Souldiggers, better known as stalwarts Sam Kelly, Spy Austin and Paul Jopson. Paul Cox made a rare trip North to headline the afternoon session with a high class band featuring The Splinter Groups’ Roger Cotton on keys. Saturday evening got underway with Bad Company and Mott The Hoople founder member Mick Ralphs with his Blues Group. With Mick seemingly happy to share guitar duties with Jim Maving, vocal and harmonica duties were left to Son Maxwell who lead the band through a variety of originals and blues standards. The crowd were once again drawn in by the intimate feel, the on stage interaction, and tasteful solos. Next Martin Turner’s Wishbone Ash provided a real ‘time-warp’ experience for those who were there first time around. The sheer quality of musicianship was there for all to enjoy as the signature sound of two guitars playing both intricate patterns and dense harmonies was reproduced by Ray Hatfield and Danny Wilson. Multi-layered vocals topped the complex arrangements. Larry McCray and his band took to the stage as the headliners on Saturday night. The grooves from this band were huge! They were bluesy, funky and soul infused, helped by the Wurlitzer keyboard of Shawn McDonald which added to the wall of sound. Larry’s guitar playing showed that he has paid his dues to many of the greats including Freddie King and Albert Collins, and his vocal style had hints of B.B King and Delbert McLinton. Larry’s delivery was polished and effortless with oodles of feel, it has to be said however that the crowd wanted more from him between numbers. Although this side of his delivery was minimal, for your author this band was the highlight of the festival. Difficult to follow, but in the side bar Tommy Allen and Johnny Hewitt created a juke joint atmosphere and played on into the night with blues-harp and guitar/percussion. First up on Sunday were Mike Bowden and Jim Williamson with Big Vern on percussion. What a joy this act was, all players were seated which added to the intimacy of their presentation as Mike’s strident acoustic guitar rhythms accompanied John’s creative electric guitar solos. Both players presented seasoned blues style vocals and their songs were quirky and amusing. Next up was The Jon Amor Blues Group, the band played tight figures whilst Jon interjected his melodic vocal lines. The two guitarists in this group have distinctively different sounds, Jon on his softer sounding Gibson, and Dave Doherty on his more cutting Fender Strat. Judging by the amount of physical activity behind the kit, I’m assuming that drummer Simon Small must be a fan of Keith Moon, and Bass man Chris Doherty was solidly with him all the way. Lisa Mills from Mississippi played a duo set with acoustic bass man Ian Jennings. This was a marked change in timbre for the crowd as Lisa’s jangly almost ‘Dobro’ sounding semi-acoustic guitar contrasted with deep rich tones from the bass. Both players were experts in using their instruments rhythmically on songs which included a tribute to Lisa’s influence Freddie King, and a version of Hendrix’s ‘Little Wing’. The last act of the festival was Andy Fairweather Low and The Lowriders. After a sound check on an Eddie Harris instrumental the band launched in to ‘Baby What Do You Want Me To Do’, a relaxed shuffle. Andy’s vocals were high in range, but his delivery was cool, the band were classy with the sort of confidence that comes from years of playing in a variety of line-ups. Everything was understated, and in control. Reggae and soul style tunes followed and then an original tune made famous by Joe Cocker called ‘Hymn For My Soul’. The set was given a change in direction when Andy decided to run a few well known numbers by guitarists who influenced him, these included The Shadows Hank Marvin, Duane Eddy, and Freddie King. A bit of a sing-along on ‘Bend Me Shake Me’ was followed by more originals such as ‘Wide Eyed and Legless’ before finishing with (If Paradise is) Half as Nice, much to the crowd’s delight. Carlisle Blues/Rock Festival is fast becoming one of Britains top festivals, perhaps in it’s own field it has already reached those dizzy heights? The over riding ‘vibe’ is one of pure connection, connection between the musicians on stage, connection between bands and fans, and connection between festival goers, many of whom travel great distances to attend – some even from Europe! The venue lends itself to this ‘vibe’ as does the warmth and enthusiasm that comes from the non-profitmaking team that runs the show, long may it continue.